In different ways, most of the left in the United States fell into line behind the candidacy of Barack Obama. That required some interesting political contortions, since every one of them knew perfectly well what Obama was about: that he was not an antiwar candidate, no leftist by any stretch of the imagination but a “center-right” bourgeois politician in the Clinton mould, who was and is an admirer of Ronald Reagan. Perhaps the most shameless were the ex-New Leftists from Students for a Democratic Society (SDS), including Tom Hayden, Todd Gitlin, Mike Klonsky, Carl Davidson, Bernadine Dohrn and the now notorious Bill Ayres. Hayden and Gitlin were on the right wing of SDS back when it called to go “part of the way with LBJ” (Lyndon B. Johnson) in the 1964 elections; Klonsky and Davidson led the little-red-book-waving Maoist “Revolutionary Youth Movement II,” while Dohrn and Ayres were leaders of the idiot adventurist, anti-working-class Weatherman faction. Having gone through a transmogrification from ’60s radicals to 21st century mainstream Democrats, their mantra is that Obama “needs a transformational movement to be a transformational president,” as Hayden put it (“Dreams of Obama,” San Francisco Bay Guardian, 20 August 2008). Unlike some of the New Leftovers, the garden variety liberals around The Nation and the Democratic (Party) Socialists of America (DSA), along with their closely associated Progressive Democrats of America, haven’t really changed in decades. A bunch of these “progressive” luminaries issued an “Open Letter to Barack Obama” (Nation, 18 August 2008), including Barbara Ehrenreich, Katha Pollitt, Marcus Raskin, Norman Solomon, Gore Vidal. They “recognize that compromise is necessary in any democracy” and “understand that the pressures brought to bear” on him are “intense,” but worry about “troubling signs that you are moving away from the core commitments ... toward a more cautious and centrist stance.” So they want to hold Obama to various stands he has taken, including “withdrawal from Iraq on a fixed timetable,” “a response to the current economic crisis that reduces the gap between the rich and the rest of us,” “universal healthcare,” etc. (Nothing about Afghanistan, of course.) If he doesn’t come through, they will wring their hands in lament. Among the professional opportunists of the not so “far left,” the name of the game was to identify as closely as possible with the masses who voted for Obama while coyly avoiding a direct call to elect him. The important social change registered in the election of a black president in this deeply racist country is labeled “historic” and “transformational” in order to attract some of his supporters by flattering them rather than telling the fundamental truth: that Barack Obama is the leader of the Democratic Party; that he will rule in the interests of capital that he is the new commander of U.S. imperialism, who presides over a system of racism, war and poverty for the millions; that it will take a socialist revolution to change that system; and that is why we must build a revolutionary workers party to lead that struggle, which won’t be decided in bourgeois elections and on TV but in the streets, in the factories, in the barrios and ghettos, and internationally. Their fellow Marcyites of the Party of Socialism and Liberation (PSL), which split from the WWP in 2004, ran their own candidates, but not as a hard opposition to the bourgeois parties. 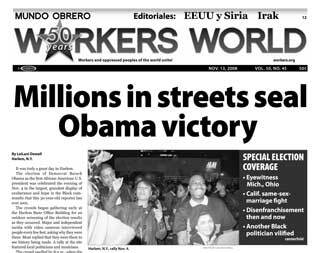 On the contrary, they declared “Our campaign has absolutely no quarrel” with those campaigning for “a Black president – regardless of his politics” (see “Socialists in Bourgeois Electionland,” 4 November 2008). 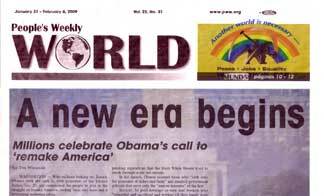 Following the election of Obama (“an occasion of historic significance”) they wrote: “What is needed is a clear program focused on what the new administration should do to meet the needs of the working people; to fulfill the expectations its campaign has created” (Liberation, 21 November 2008) The PSL then lists a series of points – declare a housing emergency, no layoffs, extend unemployment benefits, health care for all, pass the EFCA, end the wars in Iraq and Afghanistan – none of which challenge capitalist rule, and concludes: “It will be the failure of the new administration to carry through this program that will expose it before the eyes of the people as another agent of the capitalist system.” This is the method common to many reformists: rather than opposing Obama outright, they present a list of pious wishes and proposals for action by the capitalist government, calculating that if it doesn’t fulfill them, people will become radicalized. More likely they will become demoralized liberals. 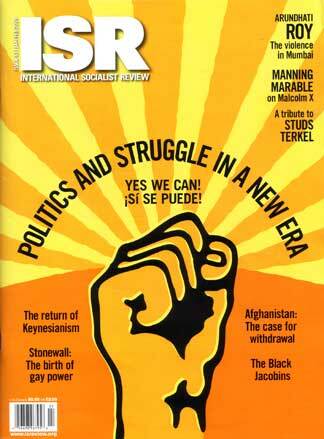 “Yes, we can elect a black president,” crows the ISO, donning the mask of militant Obamaism. See inside pages for any mealy mouthed criticisms. Not a hint of the Marxist analysis of the state as the instrument of capitalist rule. For the ISO, it’s all about pressure. Actually, that argument was popularized in the 1930s by John L. Lewis of the United Mine Workers, who viciously repressed “reds” in the UMW (and ended up a Republican). The masses learn through struggle, say ISOers. Yes, but only if the revolutionaries speak the truth plainly. And the plain truth is that it is necessary to draw a class line between the exploited and oppressed, on one side, and their exploiters and oppressors, on the other. And Barack Obama is on the other side of that line. In the recent election, some “progressives” sought refuge in the Greens, a minor capitalist party, which ran former Democratic Congresswoman Cynthia McKinney for president. McKinney has taken some gutsy stands, calling for freedom for Mumia and traveling on a boat carrying medical supplies to Gaza in the middle of the Israeli bombing attack. But she remains a bourgeois politician and the whole purpose of her campaign was to pressure Obama to move slightly to the left. Thus in a TV interview after the Gaza-bound ship was rammed by an Israeli patrol boat, McKinney pleaded with President-elect Obama to “say something, please, about the humanitarian crisis that is being experienced by the people [of Gaza] right now.” Yet Obama’s refusal to condemn the massacre and his statement in an interview with Al-Arabiya TV that “Israel’s security is paramount” makes it clear where he stands – on the side of the Zionist butchers. For the last year, liberals and reformists of all persuasions have salivated at the prospect of a new layer of young activists for social causes coming out of the Obama campaign. But contrary to the delusions of a Tom Hayden of “an explosion of rising expectations for social movements – here and around the world – that President Obama will be compelled to meet in 2009,” the operation that elected Obama was not a “movement” for “social change from below.” Rather, it was a capitalist-financed, top-down electoral machine similar to the NGOs (non-governmental organizations) orchestrated by U.S. imperialism to undercut inconvenient governments from Venezuela to East Europe and the countries of the former Soviet Union. In any case, rather than a classless “movement” to pressure Obama, what’s urgently needed today is a revolutionary workers party to mobilize the exploited and oppressed against the attacks of the bourgeois rulers.